TracMec manufactures custom-tracked undercarriages and apron feeders in Italy. TracMec’s product range spans various applications, including trenchers, stackers, conveyors, surface miners, blast holes drill rigs, excavators, cranes, demolition excavators, material handlers and machines with an operational weight up to 250t. TracMec is supported by the in-depth experience of its technicians, which it has developed from working with industry leaders. Clients benefit from TracMec’s experience and product flexibility, so that they have the means to achieve their goals. TracMec’s products comply to the ISO 9001 quality standard and EN3834.2 welding certificates. All undercarriages manufactured by TracMec include the highly appreciated ‘Online Spare Parts Service’, which gives clients quick online access to lists of spare parts and plans. TracMec works with its client to make the most of their equipment. The types of undercarriages supplied by TracMec include couple of tracks, fixed, pantograph, parallel, telescopic and H-type. TracMec is the perfect technological partner that leads to great results by achieving demanding tasks by the most innovative projects. Up to now more than 350 different types of undercarriages have been manufactured so TracMec has expertise to design and produce also your new undercarriage. TracMec’s apron feeders are designed for heavy-duty applications and its dimensions and capacity specifications can be customized according to the client’s requirements. They are built using tracked undercarriage parts, which include chains, sprockets and idler rollers. TracMec also produces complete undercarriage solution for stackers and conveyors. 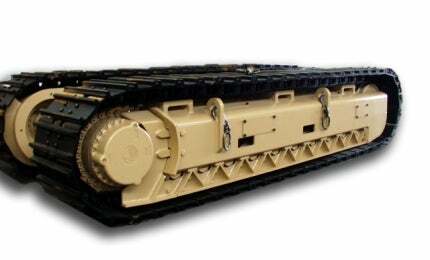 In addition, TracMec produces also tracked side frames used in trenchers and surface miners. TracMec has a flexible, simple approach and strong global network due to its parent company, the Bauer Group. TracMec aims to expand its services worldwide through Europe, America, Middle East and Russia, while expanding its client base and its business network. The Bauer Group has facilities worldwide, which allows TracMec to have a logistic support structure for original equipment manufacturers (OEMs) for providing car-bodies, lower, side frames and undercarriages for all kind of machines. Established in 2005, Tracmec currently has more than 20 years of experience of manufacturing undercarriages due to previous expertise of Gallotti. TracMec continually responds to market challenges and supplies products with high-quality designs, materials, innovation and technological content. TracMec supplier of custom and standard undercarriages will be exhibiting at MINExpo, Las Vegas on the 26-28 September. Tracmec crawler undercarriages are the best way to move your mining machines such as stacker, conveyor, trencher, blast hole drill rigs, and any other special units. TracMec's apron feeder could help operations save more time and money than a machine designed and supplied by a specialist. Couple of tracks are used in the mining sector, for example, in blast holes, drill rigs, surface miners, trenchers or mobile stacking systems where there is a need for top-quality fixed or tilting tracks with strong components to make the tracks reliable and durable. Generally, the extendable undercarriage gives the option of using a reduced width for transportation and enlarged width for greater stability. The H-type undercarriage is mainly used when there is a limited need to change the width of the undercarriage, from a reduced option for transportation or wider for added stability. The Pantograph undercarriage is one of the most advanced and high-performance models available, offering the biggest width expansion range. TracMec, a leading manufacturer of complete crawler assemblies and crawler undercarriages, is pursuing its strategic worldwide growth among different areas. Tracmec, following its strategic worldwide growth among different areas, will be participating in the next weeks in two of the most important shows in the construction, drilling and mining business, which will be held in Europe and North America.